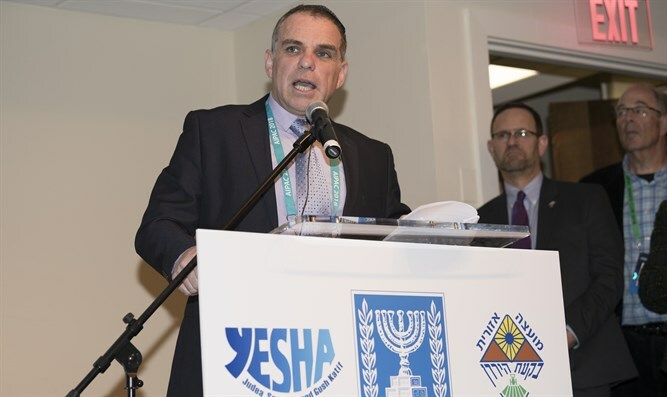 Four hundred participants packed into an event to support Yehuda and Shomron in face of delegitimization and boycotts, the event was organized by Yesha Council in partnership with the Ministry of Strategic Affairs and Jordan Valley Municipal Council. Minister Gilad Erdan sent a heart-warming video message while Oded Ravivi, Chief Foreign Envoy of the Yesha Council, Education Minister Naftali Bennett, Justice Minister Ayelet Shaked, Energy Minister Yuval Steinitz and Israel’s Consul General to New York Ambassador Dani Dayan where among the VIP speakers. The event focused on solidifying Israel’s connection to her ancestral heartland and building bridges for peace by supporting the industrial zones of Yehuda and Shomron which employ thousands of Israeli and Palestinians that work together in peace.